2010-11 Score Hockey is a solid product for beginner collectors and kids. 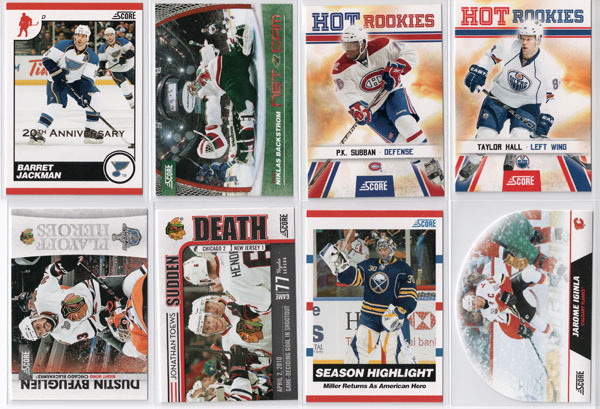 In terms of $1 per pack hockey products, Score is a far superior product to Upper Deck's currently available Victory hockey. The great thing about Score is that it gives kids a chance to collect players like Taylor Hall, P.K. Subban, Tyler Seguin, Magnus Paajarvi, Jordan Eberle and other big name 2010-11 NHL Rookies. While opening the box I couldn't decide whether the card design was disturbing or intriguing, seeing as how 1990-91 Score was the epitome of overprinting in the decade of sports card excess. I've never been a big fan of Score's glossy parallel system, you can go through a stack 5 times and still not pick out all the glossies. By far the coolest looking cards in the set and perhaps one of the coolest $1 per pack inserts in years are Score's Snow Globe die-cuts. After sorting over 100,000 cards by year, set, insert and number, I noticed something very small, but important in Score's card design, you can stare at the up right corner when pulling cards out of a stack. The highlight base cards feature a blue score logo in the upper right corner, the same corner that the symbols appear on the cards of award winners and Stanley Cup Champions. This little detail represents a small step in a great direction. The checklist is insanely deep and comprehensive, covering nearly every current NHL Player, a handful of the season's biggest rookies and does an excellent job of capturing the moments that defined the 2009-10 NHL Season. The checklist is a perfect fit for younger set builders as well as budget set builders. The short printing of a handful of the base set's Hot Rookies was a nice touch. Seeing as how Score is a $1 per pack product, the odds of pulling anything of substantial value border on impossible. There are autographs in the product, just don't expect to pull one. Score's value isn't found in flipping the cards for profit, it's found in the fun that can be had building the base set or collecting your favorite players, rookies and teams. Score is a fun product that kids and budget collectors will certainly enjoy. The lengthy checklist, Snow Globe die-cuts and Hot Rookies add up to a pretty enjoyable, low-risk box break. There's something extremely fun about opening 36-packs of a new product for under $30. This is pretty much what I expected of Score, although the 20th Anniversary and glossy parallels are disappointing. The question is: Is it worth the $60 to buy 2 boxes to complete most of the set or should I just wait and buy the base set on ebay? I’ll probably buy the boxes because I love cracking packs, and 72 packs for less than $60 is insane.